Over at Economix, Laura D’Andrea Tyson says it’s pretty unlikely that competition between insurers will lower healthcare costs, as Paul Ryan and Ron Wyden hope. After all, private healthcare premiums — where competition should be keeping costs down — have grown at a faster rate over the past 40 years than Medicare costs per beneficiary. 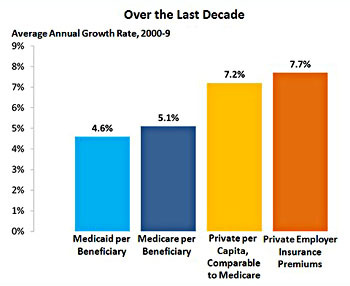 The actual numbers she cites, from the Center for Budget and Policy Priorities, seem a little iffy to me since they compare two different things (premiums vs. actual costs), but still, there’s plenty of evidence to suggest that Medicare really is better at controlling costs than private insurers. But why? Medicare has much lower administrative costs than private insurance (administrative costs account for about 14 percent of health care spending, or a whopping $360 billion a year). So I guess I wouldn’t give Medicare quite such huge props for controlling costs. There’s probably less there than meets the eye. Still, even if the numbers aren’t as impressive as Tyson suggests, there’s not much question that private healthcare providers have never done better at controlling costs than Medicare, and have almost certainly done at least a little worse. This doesn’t bode well for the notion that unleashing the forces of free market competition will do much good for Medicare. 1Austin Frakt emails to point out that the incentive isn’t really all that small. The value of a dollar of healthcare benefits is actually substantially higher than a dollar of wages. Will Obamacare Spell the End of Employer Insurance?